This particular song has been almost 17 years in the making. When i was about half my current age and still a teenager, i wrote a couple of songs on spanish guitar (with terrible playing technique) that were heavily inspired by how the castlevania franchise (especially earlier entries, and besides not too many were out back then) fused classical tensions and flavour with modern rock/blues sensibilities. I had noone interested in that type of sound to collaborate with in a band, so the songs got nowhere. Since they do me no good in the back of my head, i just recently elected to rearrange them for the NES. So in a way they’ve come full circle back to the musical medium that inspired me. Naturally, they’re for the gothic platformer project. This way, i’ve accidentally managed to expand the projects’ history retroactively from 2 to 19 years and going, haha. The first rearrangement just got where i want it, so here it is. As before, feel free to chime in with thematic associations and critique. Edit: Replaced the old upload with a newer version which made a few things a bit clearer. This month and the previous have been slow going, NESdev-wise. But here’s an almost finished concept for the ”dystopian wasteland of neo hong kong” that Project Blue is set in. Level 2 concept. Subject to change. Click to view full size. Due to the screen-flicking mode of camera movement (as opposed to scrolling), you’re afforded a bit of leeway when it comes to positioning the far background as you see fit – as long as the next screen hide the discontinuation (which is the function of the lower right quarter). Another trick (not shown here, but i aim to return to showcase it) is how you can achieve a sense of elevation by reusing the same piece of far background set at different heights on screens following each other vertically. That’s what the far background in the upper right corner is for. This scenery follows the creation formula i wrote in the article ”making worlds alien” somewhat. First off, the history was first imagined before i went on to draw the blocks. Note that the following is just part of the process and not necessarily the story the game will officially adopt as-is, but we’ve worked out the boiler plate nonetheless. Basically, the fictional city of neo-hong kong is loosely based on an extrapolated subset of features of real-world current mega-cities; among them of course also the original Hong Kong. In this fiction, the quick growth of economy and population combined with a difficult terrain to zone/exploit (lots of mountains on a peninsula) leads to high rents, cramped living spaces, and informally converted offices turned into black market squats (cubicle homes), sometimes even in unfinished or disused projects. There’s just no room for unexploited real estate. Because of the illegal status and sub optimal living standards, OMNICORP, who in this cyberpunk fiction is an entity already extremely influential in official policies, maybe even acting as a parastate, were at some point in the future able to dezone this particular area for their highly lucrative military/security research complex. I imagine most squatters were forced into terrible sweatshop contracts moving into OMNICORP owned coffin hotels elsewhere. There are still dwellers living in this institutionalized drone-warzone, however they’re essentially guinea pigs for post-genève experiments. Adopting the mentality pf rodents to survive, they quickly scurry underground or into crawlspaces whenever they hear the hum of a hoverbot. At the event of Blue’s escape from the lab, this zone is now bustling with automated security detail. Because of the hot weather, there’s a lot of makeshift electrical installations for fans. I tried to make the tileset reflect on the disuse, military testing, and squats. You’ll find DIY electrical installations, makeshift plank bridges, and crawlspaces. 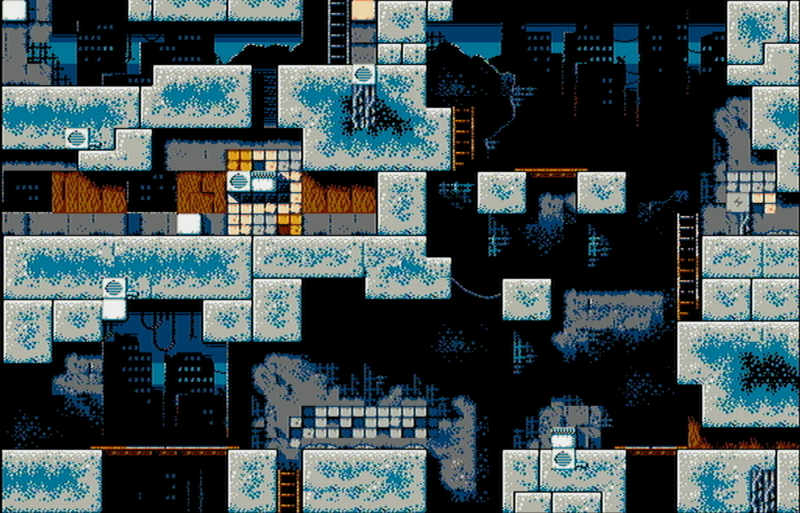 The level is intended to have the thematic structure of a series of ruined office buildings, with varyingly wide gaps between them. This to present as many opportunities as possible to make use of it’s slightly aerial-themed new mechanisms: there’s fans, parashutes, rotor blade-carried sentries, and moving platforms(tm). Some mechanisms aren’t drawn yet. Instead of the lasers from the first level, we’re looking to have little electric zaps from faulty wires, and sharp rebar spikes instead of the slime pools. Both these give material reason for more liberal placement, opening up the possibility for some new puzzles. (Picture not descriptive of any of the tracks, either). So, here’s track 16, 9, and 8 from the gothic platformer project as they currently are. They loop once before fading out. All are intended for levels. I’ve chosen not to disclose working titles to free them of pretext. If anyone is taking the time to listen to them, i’m eager to hear what your associations are regarding theme, locale and setting to see if they match my intentions. Below is a form to let me know directly what you think of each song. If you take the time to fill it out, i’m obliged! Many thanks. Johnathan Roatch (known on nesdev as jroatch) commissioned me to make a demo/splash screen for his new NES character cell codec. One thing that sets it apart from previous compression models is that it swaps colur entries around to achieve a better ratio. These states will be seen a lot during gameplay. We’re announcing Project Blue (a joint effort between me and Toggle Switch), a game that will enter this years’ NES dev competition which ends in January, 2018. Help Blue through up to 64 screens of high-tech action platforming and measure your skills against combinations of a dozen or so different enemies, a big bad boss, and various traps and obstacles. (early concept screen not taking into account all the software priorities made both before and since). Maybe the coolest thing, although it stays out of the compo itself, is the custom level editor application that toggle switch did, with which one can design levels for Project Blue without needing to know the first thing about assembly, or programming in general. I’m personally amazed that he made a tool that will let gamers modify this coming NES game relatively easily. The plan after the compo is finished is to expand this game to make it larger, to justify a commercial standalone release on a physical cartridge.